1617 S. St. NW, WDC, 20009 (Rear Entrance- by way of the alley). The exhibition continues through October 28. The Hirshhorn Museum and Sculpture Garden will have my good friend Mark Cameron Boyd giving a talk as part of the Friday Gallery Talks on Oct. 3, 2008. He will speak about John Baldessari's work, Exhibiting Paintings, in Currents: Recent Acquisitions. Meet him at the information desk at 12:30 pm. Recent Prints by Ellen Verdon Winkler, one of my favorite DC area printmakers, opens at Washington Printmakers Gallery with a First Friday Reception, October 3, 5-8pm and then an Artist’s Talk and Reception, Sunday, October 5, 2-4pm. For this exhibition, anticipating a possible move from the DC metro area, Winkler was determined to get to know the city better. She began bicycling through the neighborhoods just north of Dupont Circle and was delighted by the visual richness and architectural detail of often over-looked places. She also encountered remnants of the past and the imagined history of the places she explored. She watched as parts of the city were stripped away for redevelopment and felt the fragility of our communities and our lives. She responded to these discoveries through visual and written language, on view this fall. 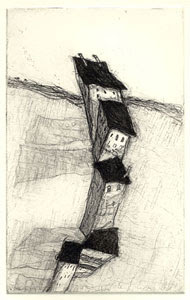 Ellen Verdon Winkler intends to create a book consisting of these images and her new poems. This exciting project is a work in progress and only four of the poems and their corresponding images appear in this show. Michael Janis, Allegra Marquart, and Tim Tate will open at Maurine Littleton's power gallery in Georgetown with a rare opening reception to meet the artists today, September 28, 5-7PM. The exhibition goes through October 18. If you haven't been keeping on with the glass revolution being ignited right under our noses, do miss this show. Seminole Community College Fine Arts Gallery is conducting a search for artists for the 2009-2010 academic year. To be considered for an exhibit, please send proposal, resume, 15-20 high resolution images, and artist statement prior to February 9, 2009. CD images will not be returned to artists as they are permanently archived in the college. For further information please call Gallery Curator at: 407-708-2704. Buyers from Russia and other republics of the former Soviet Union account for almost 50 percent of total global sales at Gagosian Gallery, the art world's global leader in exhibition space, said one of its directors. Read the story by John Varoli here. Wanna go to a closing reception tomorrow in Philly? On Loss and Memory - Closing reception, September 27, 3-5 pm. Join Aurora Deshauteurs, Hannah Dumes, P. Timothy Gierschick II, Kay Healy, Geoffrey Hindle, Michelle Provenzano, and Angela Washko, for the closing reception. Fun, food and drink to be had by all. (Corner of Berks St. & Germantown Ave, across the street from Cousin's parking lot) in the Old Kensington section of Philadelphia. I asked the question Is there such thing as right wing political art? and my good friend Jeffry Cudlin offers his opinion here. 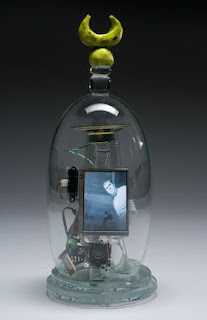 The Smithsonian American Art Museum announced today that Mark Dion is the 2008 winner of the museum's Lucelia Artist Award. 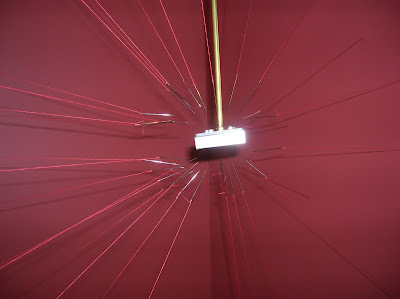 He was selected by an independent panel of jurors for "his prolific creativity and impressively varied body of work, which includes mixed-media installations, sculptures and public projects that explore the relationship among art, science and history through pseudoscientific methods of investigation and display." Dion is the eighth annual winner of the $25,000 award, which is intended to encourage the artist's future development and experimentation. The Lucelia Artist Award is part of the museum's ongoing commitment to contemporary art and artists through annual exhibitions, acquisitions and public programs. The five jurors who selected the winner are Mark Bessire, director of the Bates College Museum of Art; Allan McCollum, artist and senior critic in sculpture at the Yale University School of Art; Nancy Princenthal, senior editor at Art in America magazine; John Ravenal, the Sydney and Frances Lewis Family Curator of Modern and Contemporary Art at the Virginia Museum of Fine Arts; and Heidi Zuckerman Jacobson, director and chief curator at the Aspen Art Museum. The ACLU of Michigan said today that the City of Detroit has dropped loitering charges against more than 100 people who were detained and ticketed by Detroit police during a raid at Contemporary Art Institute of Detroit in May. Marine life painter and conservationist Wyland has been cited in the Congressional Record as, “the finest environmental artist in the world.” Beginning September 26, the California-based artist will have one of his monumental murals, “Hands Across The Ocean” – the 100th and final work in his “Whaling Wall” series – installed on the National Mall for 8 days. The 7 block-long piece can be viewed opposite the Smithsonian National Museum of Natural History. Wyland began his “Whaling Wall” series in 1971, and it is the largest environmentally themed public art project ever. The first 99 “Whaling Walls” are seen by an estimated one billion people annually at permanent installations in the U.S., Canada, Japan, Australia, Palau, Mexico and France. Following its exhibition on the National Mall, "Hands Across The Ocean" will tour the U.S. before finding a permanent home. Palin will be at the Irish Pub on Walnut Street [Philadelphia] on Friday night for a public debate watching party, if the debate between John McCain and Barack Obama continues as planned. And last week, while I was gone to Florida, McCain had a huge rally in my crib in Media, PA. A few days earlier, Biden was also in Media, but his rally was at a local orchard. By the way, we recently went apple picking at that orchard and now we have a million pounds of apples. I could use some good apple recipes! Whino Films is the latest from the innovative minds over at Art Whino. They will be documenting the art Scene in the DMV (DC, MD, VA). If you missed that opening, then make sure you come out tonight to "Block party 2" from 7-11pm This special event will have music by DJ Munch, and a special appearance by Grammy Winner Tony Rich (Hidden Beach Records). Complimentary beverages, light food, plus giveaways/door prizes provided. 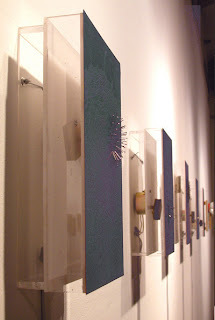 Cindy Cotte Griffiths reviews Glass Evolving at VisArts in Rockville. There's a revolution in fine arts glass going on right now, and many of the guerrilla leaders are right here under our noses in the Greater Washington, DC area. Go see this exhibition in Rockville (through Nov. 15) and then this Sunday go to the opening reception for this show at the Maurine Littleton Gallery in DC. The Philadelphia Museum of Art has named Peter D. Barberie as its new curator of photography. Barberie is currently a lecturer at Princeton University. He replaces Katherine C. Ware, who is leaving soon to become the new photography curator of the New Mexico Museum of Art. The Smithsonian Board of Regents yesterday continued to transform its operational structure by electing Patricia Q. Stonesifer, the former chief executive of the Bill & Melinda Gates Foundation, as the chairwoman of its board. The Arlington Arts Center, which is currently hosting the exhibit "Picturing Politics 2008," will have a discussion panel tomorrow titled "From the Gallery to the Street." Josh Shannon, Welmoed Laanstra, and my good bud Kriston Capps will discuss political art and its impact. It all begins at 6:30 PM. My question(s) to the panel: Is all contemporary American political art on the left wing of the political spectrum? Is there such thing as right wing political art? Yesterday I told you about a new DC initiative to turn the unused Dupont Circle underground into an art venue. Heather Goss over at DCist has a great report on this exciting subject. Read it here. Heather also has a great Arts Agenda update on openings and events going on; read that one here. Ann Hamilton, a visual artist known for her eye-popping installations including paper-sucking machines and a weeping wall, is among the winners of the Heinz Family Foundation's Human Achievement Awards. Expo is open to the public all day today and closes at 6PM. View the works of over 100 fine artists and galleries from across the country. Enjoy seminars, spoken word and live performances throughout the day. At 2pm, the house will really be rockin’ with the inspirational voices from three different local choirs. Michael Janis, Allegra Marquart, and Tim Tate will open at Maurine Littleton's power gallery in Georgetown with a rare opening reception to meet the artists on September 28, 5-7PM. The exhibition goes through October 18. Heading to Miami... more later. Some posts have been already scheduled for the next few days. The Washington DC International Arts Expo opens to the public this morning. View the works of over 100 fine artists and galleries from across the country. Enjoy seminars, spoken word and live performances throughout the day. In the evening, attend two special events benefiting local arts programs, Life Pieces to Masterpieces and the Washington Project for the Arts. Making its inaugural debut, The Collective Collaboration Project joins students from various arts programs across the country to present their original mural designed with the theme in mind, “Artists Are Colorless.” The goal of this project is to not only engage the creative mind of our next generation of fine artist, but to teach them how to work together no matter their creative differences. A cash award will be presented to the school with the best mural. Hosted by 88 and X Culture TV, late night owls and the party people will be in the house to “xperience a 21 century art happening for the mature!” A fast-paced inspired and inspiring event that brings artists off the canvas, out of their studios and into a live-action, multi-media environment. Click here to find out a happy story on what artwork is in John Travolta's new yatch. 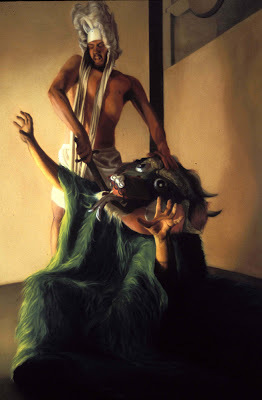 By the way, Elena Maza, the artist in this case, also writes political/Cuban op-ed pieces here. (Via DCist)"Former BET exec and video marketing entrepreneur Gloria Nauden has been named Executive Director of the DC Commission on the Arts and Humanities." From what I can find on Google, Gloria Nauden is the founder of Radar Entertainment Group, a District-based boutique marketing and video production company. They provide specialized marketing services to companies such as Verizon, Lincoln Mercury, Moet Hennessy and XM Satellite Radio. Nauden previously worked as an executive at Black Entertainment Television in the Strategic Business Development division, where she is credited with "successfully managing a $12 million development budget with 250 employees spanning three states." Nauden has lived in the District for almost 20 years, and serves as a volunteer at numerous civic organizations including, Parklands Community Center; Sasha Bruce House; Foods & Friends; The Covenant House; Thurgood Marshall Center; and House of Ruth. We welcome Gloria Nauden to that very important job; Bienvenida! "Relatives of one of the world's most famous portrait photographers have sued a Manhattan gallery, saying it lost valuable photographs created with Spanish surrealist master Salvador Dali. A daughter and two grandchildren of the late Philippe Halsman say in a lawsuit 41 of the works created by Halsman and Dali were reported stolen in April 2007. The works were among dozens delivered to the Howard Greenberg Gallery in 2003 and 2004. The federal court lawsuit demands $684,000 in damages." Ann Temkin, once from the Philadelphia Museum of Art, is now the Museum of Modern Art's new chief curator of painting and sculpture. She succeeds John Elderfield, who retired as chief curator of painting and sculpture in July. 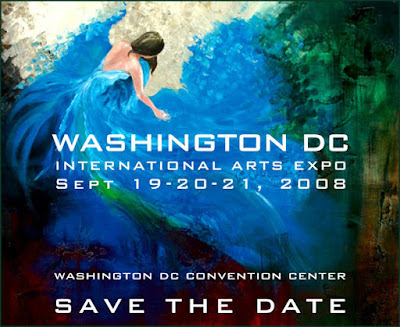 The Washington DC International Arts Expo opens to the public tomorrow. View the works of over 100 fine artists and galleries from across the country. Enjoy seminars, spoken word and live performances throughout the day. In the evening, attend two special events benefiting local arts programs, Life Pieces to Masterpieces and the Washington Project for the Arts. "This spring the state apartments of Italy's presidential palace, the Palazzo del Quirinale, hosted a remarkable exhibit of ancient Greek, Roman, and Etruscan artifacts, all of them found on Italian soil but held until recently in private collections and museums in the United States, notably the J. Paul Getty Museum and the Museum of Fine Arts in Boston. The exhibit marked a diplomatic coup for Francesco Rutelli, the former mayor of Rome who until last April had served the left-wing government of Romano Prodi for two years as minister of culture. Through an arrangement of long-term loans and the deft application of diplomatic pressure, Rutelli had convinced museum directors that returning these artifacts, all of them acquired from dealers whose methods were not entirely scrupulous, would help to discourage the knowingly illegal looting of Greek, Roman, and Etruscan sites in Italy." Read the New Republic article here. The rest of the planet has to return every Italian artifact that doesn't pass the Italian dodgyness test to Italy? If the answer is Si! Then do Italian museums have to return Roman antiquities that were made in other parts of the Roman Empire to the nations that now exist there? If Si, then Italy better start packing the 13 Egyptian obelisks that are now part of Rome. The "dealers" who brought those pieces to Rome did so by force. Newsflash: Cairo is clearing out some spaces for them! Does every dodgy mummy have to find its way back to Egypt? 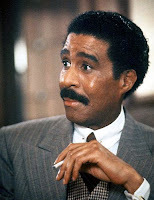 I know what Richard Pryor would have said. The Corcoran Gallery of Art seeks a part- or full-time curatorial intern for its Photography and Media Arts department. The Keim Internship is a one-year internship intended for recent graduates with a BA or BFA who seek museum experience prior to entering a graduate program in Art History or a related field. • Assistance with programs that pertain to the Photography and Media Arts department. • The ideal candidate will possess a strong knowledge of the history of photography and will have an interest in working with the Corcoran’s photographic collection. • Previous experience in arts or collections management, at a museum, art gallery, alternative art space, or historical collection, is strongly preferred. My good friend Myrtis Bedolla has opened a new gallery in Baltimore on the first floor of a Victorian-era town house at 2224 N. Charles St., replacing her Capitol Hill space in Washington. Edward Gunts in the Sun wrote a nice article on the subject; read it here and visit the gallery website here. 'Dr. Clough’s own travel must now be approved by the Smithsonian’s chief financial officer. Dr. Clough has also resigned from his salaried positions on three corporate boards. From 2000 to 2006 his predecessor, Mr. Small, spent 64 business days serving on corporate boards that paid him a total of $5.7 million. Mr. Small’s salary was $916,000 in 2007, but the Smithsonian is paying Dr. Clough $490,000. He pays his own rent on a town house near the fish market in southeast Washington; Mr. Small used a Smithsonian housing allowance for his town house in an affluent neighborhood in northwest Washington. Dr. Clough’s home is about a quarter-mile from the Smithsonian museums, so he can walk to work; Mr. Small used a chauffeur. Read the NYT article by Robin Pogrebin here. My good buds Laura and Rob at ArtPark have a fascinating post on Neuberger Berman, a division of Lehman Brothers. Tomorrow evening the District's next experiment with an art fair opens with the Artists Preview Reception and Fundraiser at the Washington, DC International Arts Expo, which kicks off the weekend with an Artist Preview and a highly anticipated Fundraising Reception with proceeds benefiting the Howard University Armour J. Blackburn University Center Director’s Discretionary Fund. Patrons of the arts along with first time collectors will join Mistress of Ceremonies Andrea Roane as she welcomes and introduces them to the artists in the Expo. Enjoy exclusive art unveilings, cash bar, wine tasting and live nationally known and local jazz and spoken word performances. Tickets $50 - details here. 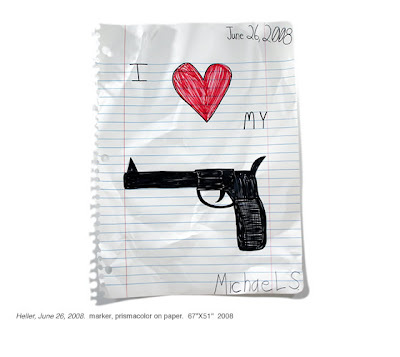 DC's Project 4 joins the trompe l’oeil mania going on in the art scene and presents Friday Night Gun Fight, a solo exhibition of new works by New York-based artist Michael Scoggins. "Making reference to Naive Art and Art Brut, Scoggins creates large-scale trompe l’oeil replications of scrawled sheets of notebook paper to voice obscure political and psychological opinions. When he reveals his ostensibly personal views and emotions, he does so in a manner that is direct, but distorted by humor and irony." Opening Reception: Saturday, September 20, 6:00 - 9:00pm. Surprised to find out that my good buddy Philippa P.B. Hughes is 39; I had her pegged at 29. I've been hearing good things about the current photography exhibition at Germantown, Maryland's Black Rock Arts Center. They have B&W photography by Joanne Miller and Lauren Henkin through September 19. Their work pairs the natural world vs. the urban landscape of Charleston, West Virginia. Their next exhibit, Portraits of Life (Artist reception: September 27, 5:30–7:30 p.m.) also sounds quite interesting: Portraiture consisting of 36 panels, providing visual imagery and personal histories of Holocaust survivors from Montgomery County. 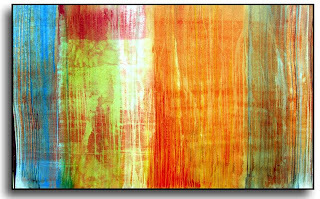 Each 24" x 36” panel contains photographs and a narrative of the individual survivor's story. Contemporary trompe-l'oeil work by Michael Fitts and Victor Spinski will be showcased at Gallery 50 in Rehoboth Beach September 18 – October 14. An artists' reception will be held Saturday, September 20, 5-8 p.m.
Michael Fitts is one of my favorite trompe-l'oeil painters around and is originally from Washington D.C. and now resides in Charlottesville, Virginia. "Consider the case of Richard Diebenkorn, whose paintings are passionately admired by countless collectors and connoisseurs of modern art, not a few of whom place him close to the top of the short list of America's greatest artists. But Diebenkorn, who died in 1993, has never quite made it into the pantheon of American modernism. 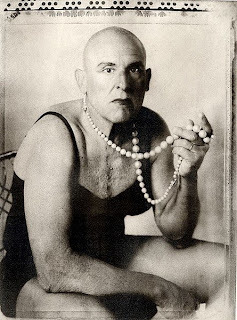 MoMA owns a half-dozen of his paintings and works on paper, all of them first-rate. And how many are hanging there today? Not a one. Why isn't Diebenkorn famous? Because his work doesn't fit into the standard narrative that many critics, scholars and museum curators use to explain the history of 20th-century art. For openers, he was a West Coast artist who spent most of his adult life in California when New York was universally regarded as the creative center of American art. And though he started out painting boldly colored Abstract Expressionist canvases that made perfect sense to the critics of the early '50s, he took a sharp turn off the smooth road of history in 1955 and returned to figurative painting, producing an even more remarkable series of portraits, still lifes and suburban cityscapes." Read this excellent WSJ article by Terry Teachout here. Art Basel, the country's biggest contemporary art show, will return to Miami Beach through 2011 under a hard-fought deal with the city that gives the show's owner a financial stake in the Miami Beach Convention Center. The center's four-day art show has exploded into a week of festivals from the mainland to Miami Beach, with a global following paying sky-high hotel rates and generating a stream of private jets that tourism officials say rivals a Super Bowl. But until now, Art Basel had refused to commit to the show for more than one year, leaving city officials to ponder losing the tourism draw to another U.S. location in their annual negotiations with Basel executives. That changed Wednesday when city commissioners ousted the management of the convention center in favor of a partnership between Global Spectrum, a Comcast subsidiary, and Basel parent firm Messe Schweiz. The deal calls for Global to manage the facility and Messe Schweiz to market it abroad. Read the Miami Herald story here. Celebrations: African American Portraits of Beauty will be on exhibit in Harford Community College’s Chesapeake Gallery in Bel Air, MD from September 18-November 3. The exhibit will showcase the works of artists including Romare Bearden, Ernie Barnes, Paul Goodnight, Maurice Evans, Joseph Holston, Bernard Stanley Hoyes, Cynthia St. James, Ted Ellis, Woodrow Nash, Frank Morrison, LaShun Beal, John Holyfield, Varnette Honeywood, Sylvia Walker, and Leroy Campbell. The public is invited to meet featured artist Larry “Poncho” Brown on Thursday, October 16, at a free luncheon and lecture, 1:30-3:00 PM, in the Student Center, Room 243, or at a reception featuring music by former HCC student Danton Whitley and Mosaic Sound, 6-7:30 PM in the Chesapeake Gallery located in the Student Center. An RSVP for lunch is required; call 410-836-4224. Trajectories: Paintings by Joan Bevelaqua and Andrew Wodzianski, an art exhibit featuring the work of these two DC area painters, will open and run from September 15 - October 18 at the King Street Gallery at the Morris and Gwendolyn Cafritz Foundation Arts Center, Takoma Park/Silver Spring Campus. This invitational retrospective exhibit, conceived and curated by my good friend Dr.Claudia Rousseau, professor of Art History, School of Art + Design at Montgomery College, will trace the "trajectories" of these two artists' work over the past decade. Conceptually, the intent is to demonstrate that a clear trajectory, wherein changes in an artist's style seem to grow from the things that went before, is among the fundamental characteristics of the truly successful artist. An accompanying brochure will be available to document the conceptual nature of the exhibit. Opening reception: Thursday, September 25, 6:30-7:30 p.m.
Wanna go to a MD art brunch reception tomorrow? Cut and Paste, an exhibit of collages by Kyi May Kaung, Patricia Zannie, and Amy Kincaid, at the Village of Friendship Heights Art Gallery (4433 S. Park Ave in Chevy Chase, Maryland 301-656-2797) will have a brunch reception on Sunday, September 14 11:30 to 1:30 pm. The show goes through Sept. 30. 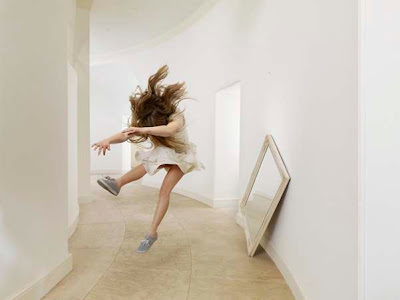 German born, London based photographer, Julia Fullerton-Batten will open DC's Randall Scott Gallery's Fall Season with her first North American solo exhibition, "In Between" opening on Saturday, September 13th from 6-9PM. Tableau Vivant, Bromoil prints by New York photographer Joy Goldkind are currently at Baltimore's Gallery Imperato (through October 18, 2008). The artist's reception is tomorrow, Friday, September 12, 7-10pm. Irvine Contemporary has a solo exhibition of new paintings by Teo González, the artist’s third solo exhibition with Irvine Contemporary. Opening reception with the artist, Saturday, September 13, 6-8PM. The McLean Project for the Arts opens its season with three rocking abstract artists: Jo Smail, Pat Goslee and Sangbok Lee. The show runs Sept, 11 thru Oct. 25 with a reception on Thursday, September 18 from 7 to 9 pm. William Christenberry: New Sculpture, Works on Paper, and Photographs opens at Hemphill Fine Arts in DC with an opening reception on Saturday, September 13, 2008, 6:30 - 8:30 PM. Through October 25, 2008. Baltimore-based abstract painter Greg Minah recently spent a month in the Mojave Desert completing the 2008 Joshua Tree Highlands Artist Residency program. Minah was one of nine artists from around the world selected for this year's residency. The light, landscape and isolation of the high desert profoundly influenced Minah as he completed the 14 new paintings currently being exhibited at Fusion Gallery in Collingswood, New Jersey. 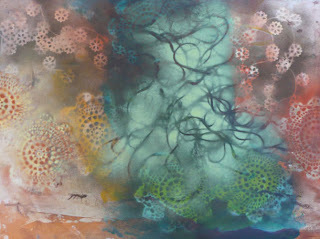 Sunstorm: Recent Work by Greg Minah is the artist's second solo showing at Fusion Gallery this year. Fusion Gallery is located just minutes outside of downtown Philadelphia in historic Collingswood, New Jersey. The show runs from September 11th through September 27th with an opening reception on Saturday, September 13th from 6-10 pm. I am a big fan of art shows in alternative art venues and you can find exceptional art and food under one roof as Arlington's Willow Restaurant hosts the Fourth Annual Metamorphosis Art Show on Sunday, September 14 from 11 a.m. to 5 p.m. The show will feature art for sale by 25 local and regional artists of all mediums, live music by many local musicians including singer - song writer Ken Wenzel, Star F.K. Radium, and Adrianne Krygowski from the Differents. Willow chefs Tracy O’Grady and Kate Jansen will provide complimentary gourmet food to art show guests. A portion of the artists’ proceeds will benefit the Non-profit Reading Connection of Arlington's Special Project "Imagination Blooms." Admission to this event is free. This year’s chosen charity is the Reading Connection. The Reading Connection is dedicated to improving the lives of at-risk children and families by helping them create and sustain literacy-rich environments and motivation for reading. One of my favorite New York painters on the planet is David Febland, and this Friday he has an opening of new paintings at Bethesda's Fraser Gallery. When I was with the gallery Febland was usually our best selling painter, and over the last couple of years his work has rocketed due to major success in Germany and London solos and the European art fair circuit. An opening reception for the general public will be held in conjunction with the Bethesda Art Walk on Friday, September 12 from 6pm - 9pm. I think that DC area painter Ted Reed is one of the supreme masters of the technical aspect of classic realism. They don't get much better that Reed when it comes to delivering superbly crafted portraits and representational work at the height of realism. 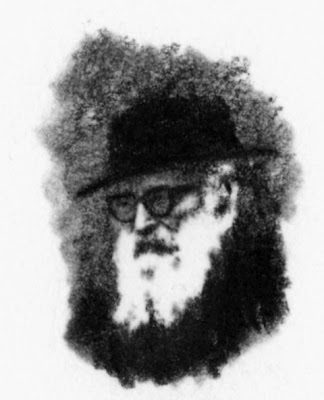 But technical wizardry is not all that makes a great painting (although it is damned well ahead of whatever is in second place), and Reed also has the mastery of many other tools that a successful painter needs: composition, creativity and that arcane ability to grab something from the subject beyond just its likeness. The vast majority of contemporary art critics seem to have an agenda that does not include contemporary realism in its portfolio; I'm not one of them. 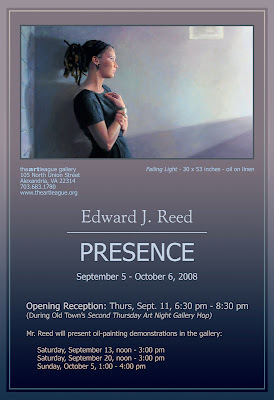 The Art League Gallery in Alexandria, VA, will hold a solo exhibition of Ted's recent works, entitled "Presence." The show features both portraits and paintings with broader narrative content and a wider emotional range than most portraits but that still focus on people as subjects. 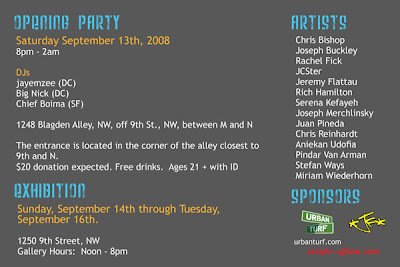 The opening reception will be on Thursday, September 11, 6:30 - 8:30PM and the show goes through October 6, 2008. The Opening Reception on Thursday, September 11, coincides with the Old Town Alexandria's Second Thursday Art Night gallery hop, when most Old Town art galleries remain open until 9:00, many restaurants offer deals, and there's live music. Click here for more details. If it is somehow possible to photograph “the Germans,” (or any other nationality)then I am told that Stefan Moses has done a pretty good job. Nobody can really describe what “German-ness” is, but to glimpse one photographer’s interpretation, stop by the Goethe-Institut Washington September 10 – October 31, 2008 to view “German Vita”, a selection of fifty of his photographs. Former DC artist Michael Sprouse opens in Delaware's Philip Morton Gallery (in Rehoboth Beach, Delaware) with an opening reception on Friday, September 12 from 5-8PM. Michael Sprouse worked in DC in the 1990s and early 2000s, and he and his partner ran the eklektikos gallery in Georgetown and then on 7th Street before they moved to Delaware where Sprouse has continued to paint and grow nationally. Leigh Conner and Jamie Smith will reopen their DC gallery at 1358-60 Florida Avenue, NE at the end of September as the new home of Conner Contemporary Art and *gogo art projects with an opening solo exhibition of new work by Leo Villareal and a group exhibition of recent work by gallery artists. They renovated the 7,000 sq ft. ground floor area into two galleries, a dedicated media room and an outdoor exhibition space. "Transmodernocean," curated by my good friend J.W. 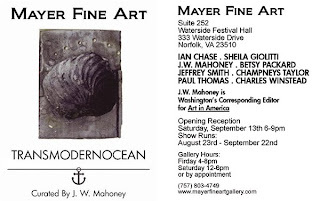 Mahoney opened last week in Norfolk's Mayer Fine Art and will host an artists and curator reception on Sept. 13, from 6-9PM. The exhibition runs through Sept. 22. Mahoney has selected work by Ian Chase, Sheila Giolitti, Betsy Packard, Jeffry Smith, Champneys Taylor, Paul Thomas, Charles Winstead and himself. You may recall how excited I was about Plein Air Easton earlier this summer (where I was a featured speaker), and I've now just found out about the Seventh Annual "Paint Annapolis," an event taking place the weekend of 18-21 in Annapolis, MD. Included in Paint Annapolis is "Dueling Brushes," a Saturday morning open air painting competition which brings more than 75 artists to downtown Annapolis to paint from 9 to 11 a.m. on Sept. 20. Right after they are finished and framed, judging starts at noon at Susan Campbell Park at City Dock, where artwork will be for sale right off the artists' easels and if my Easton experiences repeat here, most of them will fly off the easels. 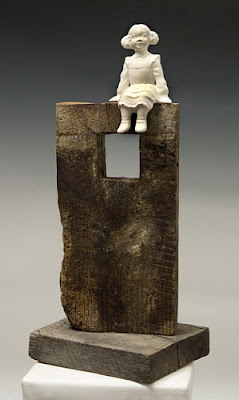 The juror is Mark Karnes, a professor at Maryland Institute College of Art for almost 30 years. If you want to register for this event, the deadline is Sept. 19 and details are here. All through the weekend, members of the Mid-Atlantic Plein Air Painters Association and area high school art students will join the 30 juried artists in this event and all of them will paint throughout the weekend and then hang their wet and framed canvases at Maryland Hall for the Creative Arts for exhibition, judging and sales on Sept. 21. On that day, a ticketed VIP "Collectors' Preview" champagne reception will be held from 2 to 3:30 p.m. in the Chaney Gallery. At 4PM the general public gets a crack at the paintings and they can cast their vote for the "People's Choice" award and attend the public reception, which is free, from 4 to 6 p.m.
An information tent will be located by the Market House, and schedule updates can be found at www.paintannapolis.com. If you want to get a taste of plein air panting, check out the below video from the similar plein air event in beautiful Easton, Maryland earlier this summer. Wanna go to a Delaware opening tomorrow? The exhibition is called "Hispanic Lives, Latin Worlds: Simple Complexities" and the guest curator is Riccardo Stoeckicht, Vice President of Operations at the Rodel Foundation of Delaware. The opening reception is on my birthday, Saturday September 6th from 5pm-8pm. and the exhibition will be up until the end of September. More info here and also here.